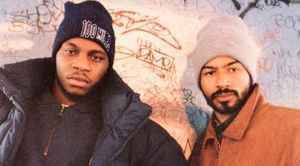 Rodney LeMay aka Showbiz and Andre Barnes aka AG are an American hip hop duo from The Bronx, New York City, New York. Showbiz (shortened his artist name to Show at a later point in time) is a producer and AG (short for André the Giant) is a rapper. They have been active since 1990, releasing their first output (Soul Clap EP) in 1991. Both artists are members of the D.I.T.C. (Diggin' In The Crates) crew. Viewing All | Showbiz & A.G. These boys are still killing it. They are just now cruelly slept on / rejected by so called hip hop fans!!! Period!!! Between 1990 and 1995 these boys were killing it. Beats are on point and lyrics are diamond.